The practice of Nuclear Medicine Technology is evolving, and will continue to change due to technology, practice and environmental factors. A two year program redevelopment phase has allowed for extensive consultation with key stakeholders. A comprehensive redesign of the curriculum was undertaken to best meet the needs of our students, clinical partners and the medical imaging community. The program will reflect the changing practice and technology in the field of nuclear medicine and molecular imaging. A hybrid learning experience will meet the needs of different learners by allowing students to participate in both online and face-to-face components. Theory will be put into practice by examining increasingly complex case studies and applying knowledge in both simulated and clinical environments. Students will work both independently and in teams to develop problem solving and clinical reasoning skills to support application to clinical practice. Nuclear Medicine is an imaging method used to safely detect disease in its early stages. The practice of Nuclear Medicine, which includes Positron Emission Tomography (PET), involves the use of radioactive tracers administered either by injection, orally, or inhalation. Special cameras, computers and radioactive tracers are used to image how disease or treatments alter organ system function. 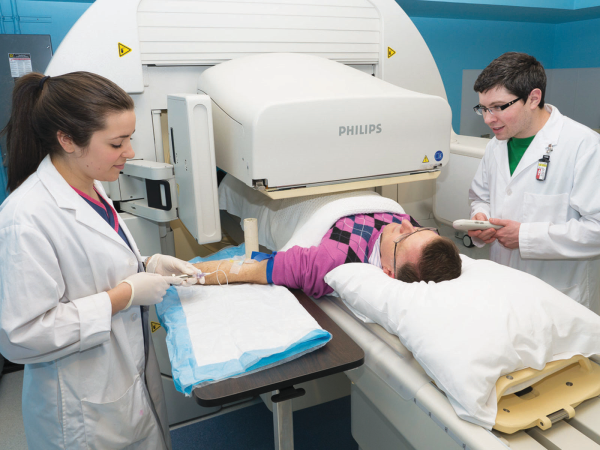 Nuclear Medicine Imaging involves non-invasive procedures that often eliminate the pain and trauma and risk associated with invasive surgery that patients would otherwise undergo, to determine the location and size of tumours, or the extent of numerous diseases in almost all of the human organ systems. It is able to non-invasively image and measure the body’s organs as they function, such as the amount of urine the kidneys produce per minute, the volume of blood ejected from the heart with each beat, and the extent of damage to the heart muscle due to a heart attack. Molecular Imaging utilizes specialized instrumentation alone, or in combination with targeted imaging agents, to visualize biochemical events at the cellular and molecular level in order to help identify regions of pathology and potential mechanisms of disease. Why become a Nuclear Medicine Technologist? Nuclear Medicine Technologists work closely with doctors, patients and other members of the health care team. Ranging from cardiology to psychiatry, nuclear medicine images and treatments are used by a wide array of medical specialties. Nuclear Medicine Technology can save patients the pain and trauma associated with investigative surgery. The detailed images that nuclear medicine scans produce can determine the location and size of tumours or diseases without surgery. This is an online course which will study the physics and biological effects of ionizing radiation. The scope of this course includes studying the fundamentals of radiation physics related to nuclear medicine, as well as X-ray physics related to CT. Radiation safety and radiation biology will be explored and will include a current and thorough overview of the effects of ionizing radiation on biological systems using case studies and clinical examples. The second in a longitudinal series of courses will use a case-based approach to integrate multiple themes such as radiopharmacy, instrumentation, image quality and the methodology of various procedures. Topics explored will include the skeletal and endocrine systems, tumors and infections. Thyroid therapy using high-dose radionuclides and an introduction to PET imaging will be also be included. Health Care Systems will build on the existing and developing knowledge of the learner to enhance their understanding of the organization and operations of the health system in Canada. It will discuss the historical conceptualizations of the provider/client relationship, which often characterize clients as the objects of care and examine, and explore the more recent concept of an integrated client-centred continuum in which individuals participate in defining and addressing their needs in the most appropriate setting. The venipuncture/patient care portion of the course will allow students to strengthen venipuncture techniques; laboratory sessions will give learners the opportunity to practice monitoring, recognizing and responding to changes in a patient’s physical and emotional status. ECG is an important aspect of nuclear cardiology. This course will act as an introduction to ECG to learn the normal pathway for the conduction electrical impulses in the heart. Finally, the radiopharmacy portion will focus on the preparation, dispensing, and shipment of various radiopharmaceuticals. Students will also participate in two offsite Positron Emission Tomography (PET) labs.